The first lecture in the debate was by Harald Bredahl from Fmc/dupont the company doing the seaweed trawling. Front page of above document. 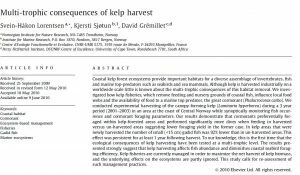 Clearly details the reduction of over 90% in the first year of the most important foraging fish in the harvested area – one can also safely assume that the area concerned was also “barely touched” by the trawlers. Harald told us that the trawlers needed such a large area to trawl (nearly the entire coast) because the sea floor was so uneven that it was impossible to harvest in most areas. Here in the last few weeks weve had anonynmous mail from apparently within the industry – it says that the areas currently being harvested are being harvested in such a way that the plants are not able to mature thus they are not being removed cleanly from the sea floor leaving most dying and rotting – if so little is being harvested surely this cannot be a problem unless one or the other piece of information is incorrect. 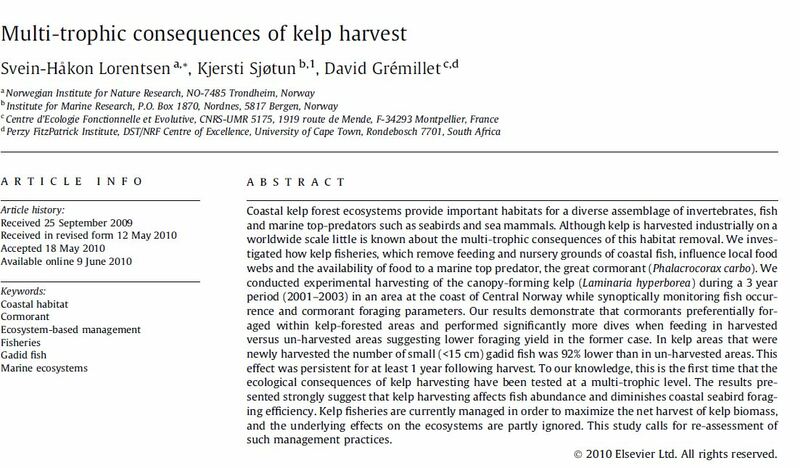 Harald also used the paper produced by Bodvin,Moi and Steen as evidence that there is no environmental or ecological damage from seaweed trawling. Here FMC is using the reputation of the havsforskningsinstitut to support the industry – when we have 3 governmental seaweed harvesting studies from the Uk,Scotland and Ireland all saying that mechanical seaweed harvesting is unsustainable, it throws that reputation into question, especially when the front page of the paper proudly announces that Fmc has contributed financially. We feel strongly that this is not evidence on the harmless nature of seaweed trawling but is in fact a serious attempt to whitewash the industry. Later in Harald Bredahls lecture the importance of the medicinal side of the seaweed industry was mentioned in some detail. Most of the miraculous cures we noticed were in the research phase – in fact nearly all were. 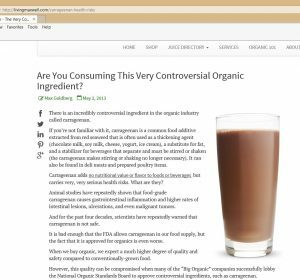 The industry is concentrating on the current fad for healthy alternatives, health foods and medicines derived from natural ingridients. First of all if seaweed derivatives are so vital for our health then it is indeed a precious commodity – using massive trawlers to scrape the seaweed beds is not a clever way of harvesting such a precious resource, especially as it destroys far more than it lands. We have reports of receeding seaweed all over our coast – clearly the state should stop this and find harvesting methods that are far more ecological and sensetive. But then perhaps this is all a bluff? The main product from the 200,000 tons or so of seaweed harvested on our coasts is alginate. This is used in food preparations and medicines – fillers mostly in the latter. However because the industry is so keen to publicise this products worth there is considerable research in univesities and other bodies. ie they are trying to convince the public that we need to keep the industry going. 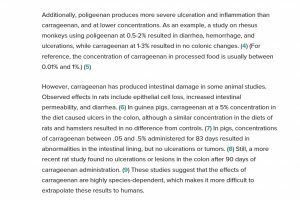 We know that the sister product Carrageenan has some serious health issues – mainly digestive – but there is no serious evidence of any problems with alginate – until now. This article from the bbc says that alginate stops the body from absorbing fat and how that could possibly be useful for slimmers. The current drug Orlistat has a remarkably impressive list of side effects. This is a drug you would only consider(not take) if you were really desperate. The question in our minds is – are these side effects from the drug or from blocking the bodies ability to absorb fat. 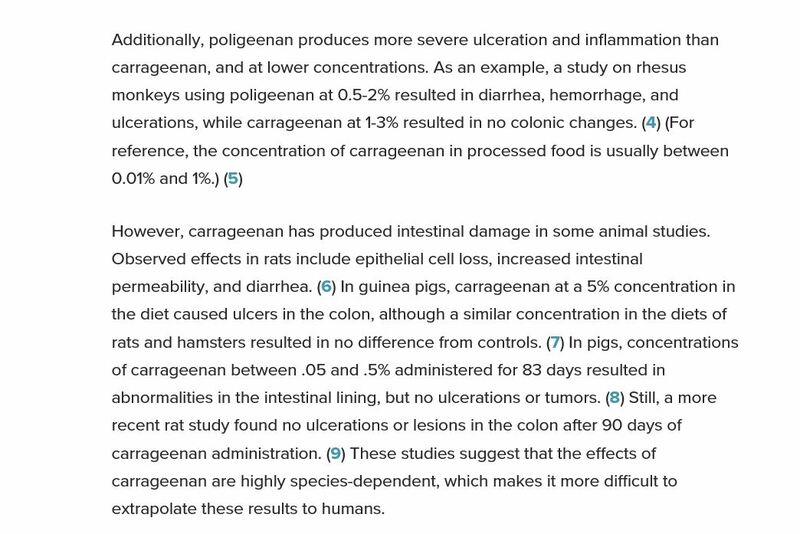 If it is from the latter then there are serious health issues indeed from alginate – however that is speculation. Unfortunately Alginate seems to be in most manufactured foods – from coatings on fresh fish, to the outside of salty biscuits- you simply cannot avoid it – it is everywhere – however the body needs fat to survive – so if some of us need less fat and we get this from our current food some of us dont then there are possible health issues. In fact we know that seaweed can contain all kinds of pollutants – from pcbs to heavy metals such as mercury and worse. Do we need this industry – especially as it is causing so much damage to our wildlife?? ?